The Plague Monks of Clan Pestilen are fanatical zealots who are utterly dedicated to the spreading of corruption and decay in the name of their Clan and that of the Horned Rat. The Monks are readily recognized by their signature apparels, such as ooze-dripping robes, soiled shrouds, bony growths and fluid-filled blisters are but one of many ways to distinguish their kind from all other Skaven. It is easy to discount their abilities, given their sicknesses, yet it seems that they find solace in their constant pain. 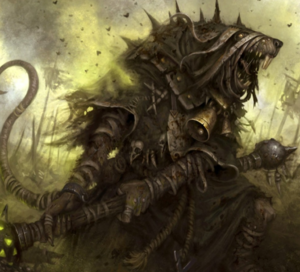 To all reasonable creatures, and to an extent, even other Skaven, the Plague Monks are a horror to all the senses. Vomit Illness +8 vs. PD - Target is weakened.